Bathtub Refinishing Dallas TX – Don’t Replace, Reface! If your bathtub, shower, tile surround or countertop is looking a little tired and worn-out, why not give it a face- lift? 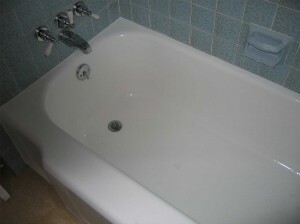 Call Dallas Bathtub Pros for surface restoration and have it look and feel brand new! 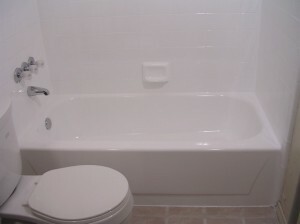 We can take care of any problem whether your tub is difficult to clean, worn out, damaged or even just the wrong color. Refinishing your bathtub is the practical, low cost alternative to replacing your tub, tile or shower altogether. Replacing your tub or shower will entail a complete demolition and renovation, costing thousands of dollars, causing a huge mess that could take days or possibly weeks to finish. The National Kitchen & Bath Association reports that the average cost of such an undertaking is over $3,000. 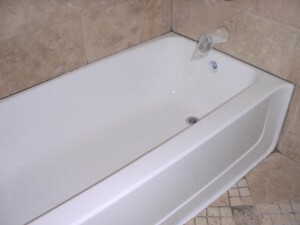 Having your tub refinished by Dallas Bathtub Pros will cost you a tiny fraction of that! We can completely repair & restore fiberglass, porcelain, acrylic and cultured marble bathtubs with our acid-free proprietary refinishing (reglazing) process. We start out using our very thorough two-step cleaning process so that all soap scum, bodily oils and mineral deposit are removed and the tub is totally cleaned. When this is finished all visible cracks, chips and anomalies are properly fixed & repaired. Once we’ve completed cleaning and patching the problem areas, we carefully apply our proprietary bonding material to make sure the bond between the old surface and your brand new finish is solid. The final process consists of a highly skilled professional applying a very unique acrylic coating using a fine spray technique. Once the process of refinishing your surfaces we start buffing and polishing every square inch so that it will be smooth and silky to the touch and have a beautiful deep glossy appearance, just like new. Our very unique proprietary refinishing process is why you won’t be able to see any difference between your newly refinished tub and a brand new one. All tub refinishers do not turn out the same quality work so we take great pride in ourselves for providing top quality craftsmanship at reasonable prices. We are perfectionists in terms of the appearance of the refinished bathtub or shower. We are also practical and our refinishing process typically extends the life of a bathtub by 12 to 15 years, maybe longer. In maintaining your resurfaced tub or shower follow all the recommendations laid down by tub manufacturers in terms of their cleaning and maintenance guidelines. We are in agreement with most of the leading tub manufacturers who advise against abrasive cleaners and recommend an environmentally friendly (green) approach to cleaning tubs and showers. Give Dallas Bathtub Pros a call today to save thousands of dollars on updating your bathroom. You could easily end up paying several thousand dollars to replace your bathtub, shower, the surrounding tile, your vanity and sink. Dallas Bathtub Pros can save up to 75% of what it would cost you to replace everything. If you are thinking about having professionals come in and refinish your bathtub, give us a call now and one of our bathtub refinishing specialists will be glad to answer all your questions.